Conceive the idea, believe in yourself, achieve the goal! 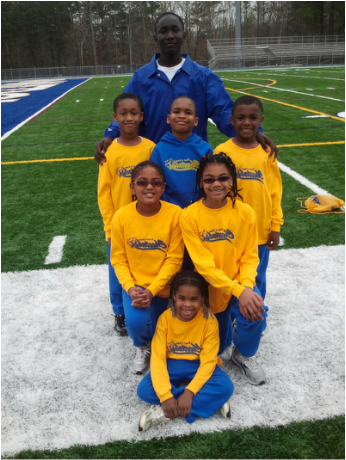 We inspire our young athletes to aspire academically, athletically, and personally by building self-esteem and providing a healthy lifestyle through competition, both on the track & field. We RISE - "Reach Inside Self for Excellence." East Cobb Cheetahs Track Club, ECCTC, is a tax-exempt not-for-profit organization that provides the community with a complete Track & Field Youth Program. ECCTC offers participants from first grade to high school positive learning and team experiences along with the opportunity to create life long memories. ECCTC provides valuable team and social experiences for the increasing population of public, private, and home-schooled youth. ECCTC offers young athletes the opportunity to participate in a variety of track & field events throughout the sport. Beginning in the first grade, these experiences provide a source of recreation and simultaneously improve athletic skills, health and fitness, as they offer experience in teamwork, sportsmanship, fair play, cooperation, and leadership. Increased self-confidence is just one of the many intangible benefits this program offers. Since our inception, January 2010, ECCTC continues to be one of the premier youth Track & Field teams in Cobb County. We seek to make the experiences affordable and available for all interested participants. This is done is done through a series of successful fundraising activities, and charitable donations. ECCTC currently has 26 young athletes throughout Cobb County, with additional youth participating on an out-of-district basis. According to Stop Childhood Obesity, childhood obesity statistics in the United States have caught the attention of every aspect of our nation recently. Between 16 and 33 percent of children and adolescents are obese. Obesity is among the easiest medical conditions to recognize but most difficult to treat. Unhealthy weight gain due to poor diet and lack of exercise is responsible for over 300,000 deaths each year. The annual cost to society for obesity is estimated at nearly $100 billion. Overweight children are much more likely to become overweight adults unless they adopt and maintain healthier patterns of eating and exercise. We at East Cobb Cheetahs look to do our part by engaging kids in a physical fitness program that will produce healthier living. Work equally as hard as a student and an athlete. Be on time -- for practices as well as competitions. Be ready to listen and work hard. Be respectful to coaches and teammates. Foul language and/or attitudes will not be accepted. Show sportsmanship at all times -- not only to teammates but also to our competitors. In an effort to serve the youth of our community, we look forward to educating our student athletes with the fundamentals of Track & Field. We will teach sportsmanship, teamwork, and leadership -- all while offering them an opportunity to compete in sanctioned competitions with their peers. We will help them understand how combining Athletics and Academics builds strong character, preparing them for life's challenges. ECCTC athletes will be given the opportunity to reach their full individual athletic potential through participation and performance. They will progress over the season by developing an understanding of the concept of "pace" as well as the mental side of running -- which will in turn greatly improve their individual times and increase the distances they can run. By carefully balancing the emotional and physical well being of the athletes with their personal desires and ambitions, we strive to help each student athlete enjoy running and have fun. ​The ECCTC program is designed to introduce kids to sprints, distance running, and field events by providing an experience that is fun, competitive, socially motivating, and informative.